Five dogs and two puppies had their day today, parading down the middle of Hamilton Avenue from their old shelter in Larimer to the new $15 million shelter in Homewood that will be operated by the two merged shelters now known as Animal Rescue League/Western PA Humane Society. Pittsburgh police cars blocked Hamilton Avenue, which at 1 p.m. was lined by dozens of clapping children and adults with their dogs, despite the rain that fell on the parade. Parading canines were joined by two kittens pulled in a wagon, a ball python cuddled and carried by a volunteer and a tiny frog in an aquarium. Rabbits, cats and a red-footed tortoise named Zelda traveled in small crates carried by shelter volunteers and employees. Fawn, a young tan-and-white terrier mix on a leash, delighted children by stopping to greet and lick them. 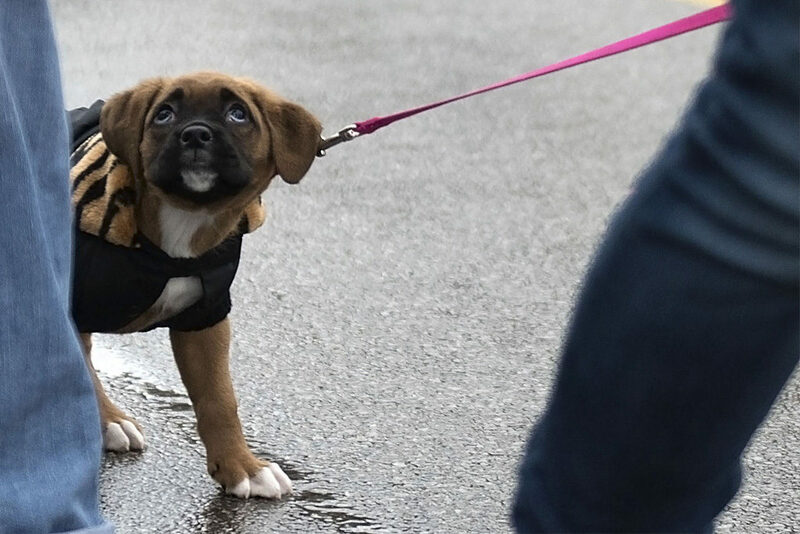 Frankie, a 7-week old boxer mix with a black face, wore a black raincoat was a real crowd-pleaser. Though clearly happy to walk on a leash, her tiny legs couldn’t keep up with the big dogs, so she traveled most of the way in the arms of a shelter volunteer. An iguana named Blue was scheduled to be in the parade, “But he had a hissy fit and didn’t want to wear his harness,” said his owner, Lorren Kazmoh, a manager of community outreach at the shelter. Ms. Kazmoh adopted Blue from the Animal Rescue League, and he often comes to work with her because he is an ambassador for the shelter and an educational animal who makes visits to schools and other facilities. Blue and other four-legged residents of the new shelter greeted the 200 people who came to the open house today, including Pittsburgh Mayor Bill Peduto and County Executive Rich Fitzgerald. The new shelter at 6926 Hamilton Ave. is twice as big as the old one at 6620 Hamilton Ave. The two “open-door” shelters merged last year under one team of administrators and one board of directors. With the partnership, the Animal Rescue League/Western PA Humane Society became “the largest shelter in the area and one of the largest shelters in the Northeast,” said Dan Rossi, CEO of the merged shelters. The humane society’s shelter on the North Side will remain in operation, as will the rescue league’s wildlife-rehabilitation center in Verona. The new shelter was designed by Animal Arts, an architectural firm based in Colorado that uses “companion animal research” to design facilities that promote “overall animal wellness and socialization,” Mr. Rossi said. That includes a state-of-the-art ventilation system that should prevent the spread of kennel cough and other contagious canine and feline respiratory ailments, Mr. Rossi said. Currently, about 200 animals live in the new shelter. They were actually moved during the past seven days, and a small number were brought back to the old shelter today for the symbolic parade. In total, $12 million has been raised to pay for the new shelter, and fund raising continues for the remaining $3 million. The old building has already been sold, to a man who owns other properties on Hamilton Avenue, Mr. Rossi said.